Doran-Jones, who represented England at Under-18 and Ireland at Under-19 and Under-21 level, made the step up to the England elite squad with just five Premiership appearances - two as a replacement - under his belt. As a result of an injury crisis in the England camp in November 2009, manager Martin Johnson called on the then 24-year-old ahead of the match against Argentina and he was eventually named on the bench for the Twickenham clash. 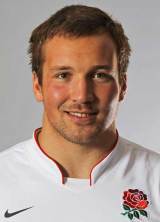 A member of England's touring party to Australia in 2010, Doran-Jones played non-cap games against the Barbarians, Australia 'A' and the New Zealand Maori. Doran-Jones joined Gloucester from London Welsh in the summer of 2009 but made the switch to Premiership rivals Northampton ahead of the 2011-12 season. The prop appeared in all of Northampton's 22 games in the Premiership but failed to feature during the Six Nations for England, eventually winning a recall for their summer tour to South Africa. A graduate from the famous Wellington College in Berkshire, he played for Lansdowne Rugby Club in Dublin while studying in the Irish capital and also spent four seasons with provincial side Leinster. A spell with Kings Country in New Zealand followed before linking up with English National League One side London Welsh. He also featured in Wasps' Guinness 'A' League success in 2007-08 before signing for Premiership rivals Gloucester.